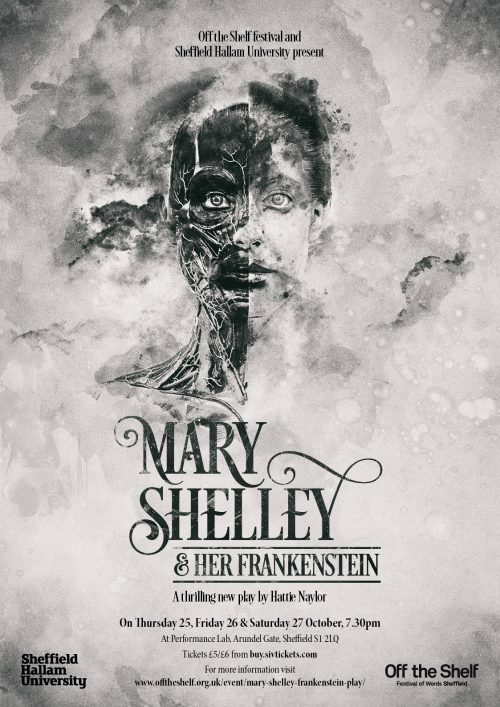 Step into the gothic past and be carried away by Mary Shelley and her Frankenstein, a thrilling production that weaves together the legacy of an astonishing writer and iconic monster. To celebrate Frankenstein’s enduring legacy, 200 years on, award-winning playwright Hattie Naylor has adapted this timelessly haunting novel that explores the boundaries of science and humanity into an immersive performance brought to life by Sheffield Hallam University’s performance students. Mary Shelley wrote Frankenstein at just 19-years-old, her life as dramatic as her fiction, and Sheffield Hallam University stage and screen professor Hattie Naylor weaves together Shelley’s letters, what is known about her tragic life and the ground breaking novel Frankenstein to create this unmissable piece of theatre. Naylors’ credits include Ivan And The Dogs, The Night Watch, Going Dark, As the Crow Flies, and Bluebeard. Ivan and the Dogs (Soho Theatre and ATC) was nominated in the Olivier Awards for Outstanding Achievement in Theatre, won the Tinniswood Award in 2010, and has been performed to further acclaim internationally. The film adaptation of the play: Lek and the Dogs, directed by Andrew Kötting premiered at the London Film Festival 2018. Mary Shelley and her Frankenstein will be performed at Performance Lab, Sheffield Hallam University on Thursday 25, Friday 26 and Saturday 27 October at 7:30pm. Tickets are £6/£5 (concs). These performances are part of Off the Shelf’s Frankenstein 200 strand and are accompanied by an entire weekend of Frankenstein inspired events (October 20-21) in Sheffield’s General Cemetery, including a pop-up performance, a Making the Monster – Special Effects Make Up Demonstration , A Monster Read – Frankenstein, or The Modern Prometheus by Mary Shelley, A Writing Workshop with Hattie Naylor, A guided walk around the cemetery, themed talks, a screening of the Bride of Frankenstein and Young Frankenstein and much so much more.